The Spartans are ending a 65-year run at the facility, playing their final regular-season game there Friday night before moving to a new high school. SANFORD — For 65 years, athletes and fans in Sanford have congregated at Cobb Stadium to be part of high school football. Friday night’s game against Thornton Academy (6-1) will be the final Sanford High football contest at the field – unless the Spartans (4-3) pull a huge upset. Then, Sanford would get to host a playoff game, too. A new $100 million high school will open next fall, a little more than three miles away, with its own “amazing athletic facilities,” Fallon said. The field lights at the new site are already up and the artificial turf field will be installed before Thanksgiving. Among the former Sanford players who have graced Cobb Stadium are, from left to right, Roland Cote, a quarterback for the 1959 state championship team; John Cochin Jr., a member of the 1952 team that played the first game at the stadium; 1979 teammates John W. Roux, Kevin Langlais and Tony Matoin (a Fitzpatrick Trophy winner); 1993 quarterback Scott Sheppard; and 2008 defensive end Nick Roux. But Cobb has the history. Set in a natural bowl behind Memorial Gym, with bleacher seats built into the hill on the home side, it’s noted for top-notch concessions and the players’ descending walk from their cramped locker room, through a human tunnel of usually young fans, to get to the natural-grass field. “It’s really been a crown jewel of Sanford,” said Gordie Salls, Sanford High’s athletic director since 1993. “I will miss the clank of the cleats walking down the hill on a Friday night. That sound, it’s odd, but it’s something I’ll never forget. Friday night, a tribute to the memories forged at Cobb will be held. The three state championship teams – 1956 and 1959 in Class B and 1998 in Class A – are sure to be mentioned. Sanford’s three Fitzpatrick Trophy winners – Paul Belanger (1976), Tony Matoin (1978) and Kevin Bougie (1999) – will get their just due. Most of all, the special connection between Cobb and Sanford will be celebrated. 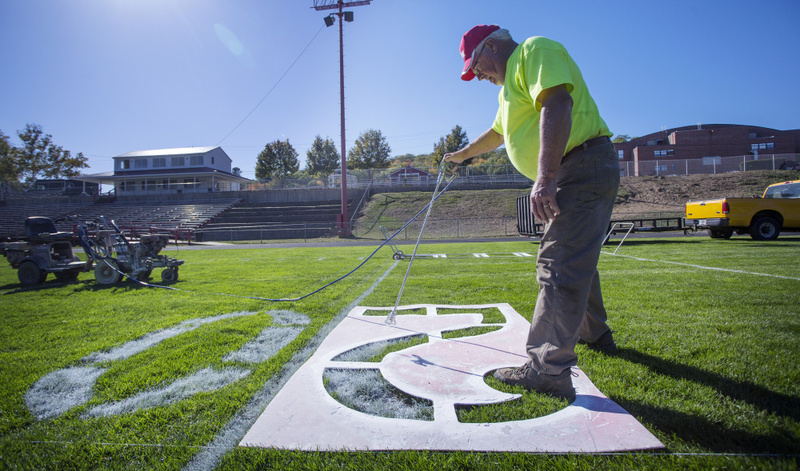 “I think it’s the best field in the state as far as spectators go,” said Matoin, 57, who lives in Springvale. Matoin started playing on Cobb as a 7-year-old in the newly formed Sanford Springvale Youth Athletic Association. He’s since seen his son, Matthew, 27, play football and his daughter Kassey, 26, play lacrosse at Cobb. “It’s sad seeing it go. Everyone is looking forward to the new school, but I’d still rather be staying at Cobb,” Matoin said. One of the traditions of Sanford football games at Cobb Stadium – even during preseason games when crowds are smaller – is the players making their way to the field next to the bleachers on the home side of the field. The Spartans will make the trip one more time Friday night. Cobb Stadium has also been home for Sanford’s soccer, lacrosse and track and field teams. Graduation ceremonies and countless youth games have taken place there. Cobb will continue to be used for middle school and community athletics, Salls said. At some point, the town will have to decide what to do about the decaying track. The facility opened with a football doubleheader on Sept. 13, 1952. St. Ignatius High of Sanford faced Jay, followed by Sanford against Brewster Academy. 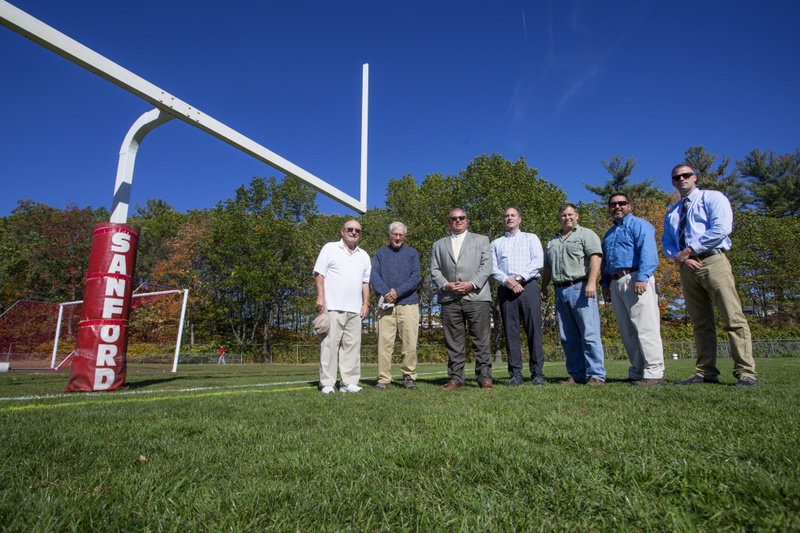 The field was dedicated to community leader and team physician Dr. Stephen A. Cobb in 1954. The first night game, using temporary lights, was Sept. 8, 1972. The current lights came two years later, ushering in Friday night football, with crowds in the thousands. Roland Cote, 75, will be one of the featured speakers Friday. He quarterbacked the 1959 championship team, taught in Sanford for 30 years, and coached numerous sports at multiple levels even longer, retiring from coaching in 2014. For more than 40 years, Cote has been the ticket taker at Cobb’s back gate, a post he took over from his uncle, Emil Cote. Chances are Cote will bring up one of his (and Fallon’s) favorite memories: the night in 1995 when Sanford snapped a 33-game losing streak with a 70-yard touchdown pass with five seconds to play. Tommy Little caught Zach Matthews’ pass after two defenders collided. The team Sanford beat that night? Thornton Academy. IT’S THE FINAL week of the regular season, and there’s a possibility for a three-way tie for first place in Class A South – if No. 3 Scarborough (6-1) beats No. 1 Bonny Eagle (7-0) and No. 2 Thornton (6-1) avoids an upset at Sanford. Assuming Windham gets past winless Bangor, a three-way tie in the Heal points would happen if Cheverus wins at Oxford Hills/Buckfield on Friday and Portland wins at South Portland on Saturday. If that happens, a coin-flip tiebreaker would determine the seeds. Scarborough finishes first if it beats Bonny Eagle and Oxford Hills wins. Thornton can finish first if Scarborough, South Portland and Cheverus all win. 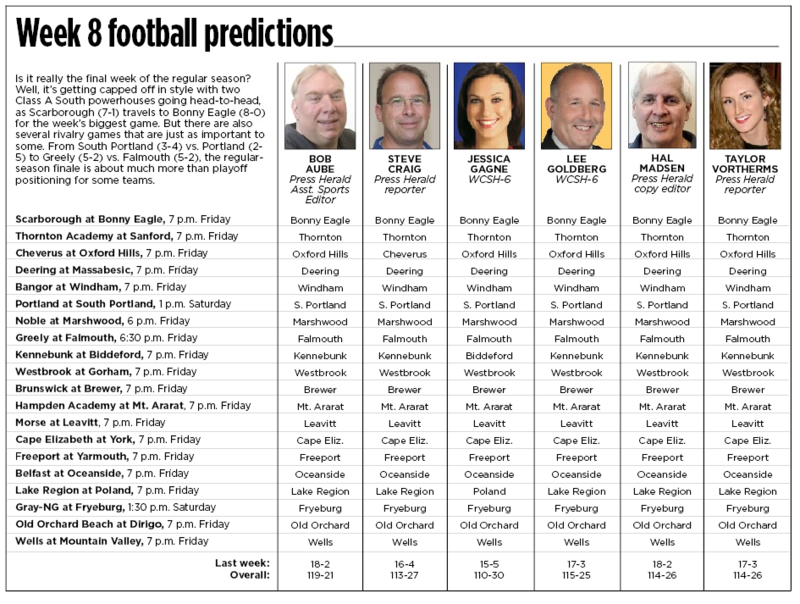 Other than the coin-flip scenario, Bonny Eagle drops to third if it loses to Scarborough. Only the top two teams get a bye in the quarterfinals, and no team that has played in a quarterfinal has made it to the state championship game since Class A’s current alignment began in 2013. “We want to win and make it a moot point,” said Scots Coach Kevin Cooper. Bonny Eagle, the defending state champion, has had one challenge this season. The Scots trailed 14-13 at Thornton midway through the second quarter, then produced a flurry of big plays and 36 straight points in less than 20 minutes of game time, rolling to a 49-14 win. 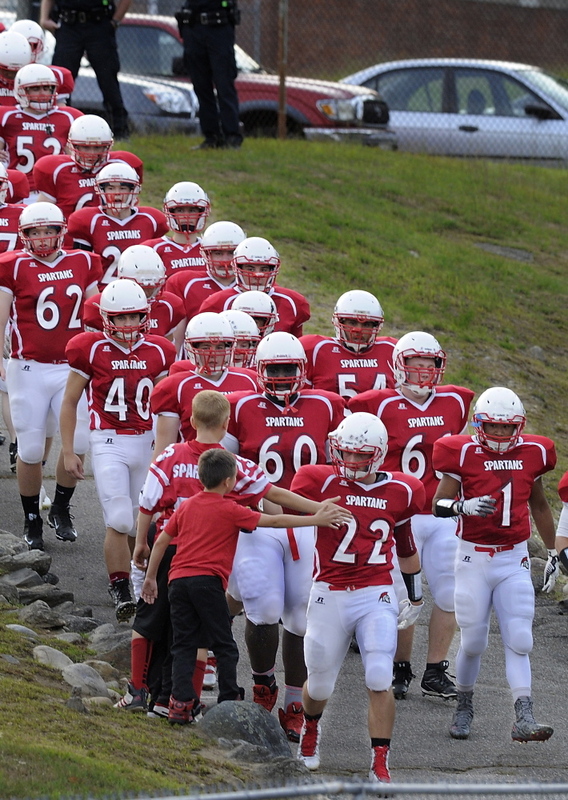 Scarborough does have an offense that can keep pace with the Scots, having averaged 56.5 points in four straight wins. “They’ve only punted the ball three times all year, and they were all against Thornton,” Cooper said of Scarborough.